Thank you once again to the Knights of Columbus (KoC) Council 9410 for supporting Ventura County veterans and their families! Their recent donation of $5,500, raised from their annual Charity Texas Hold’em Poker Tournament and Monte Carlo Night, will support all of our programs and services. To date, KoC has raised and donated more than $46,000 since 2014. 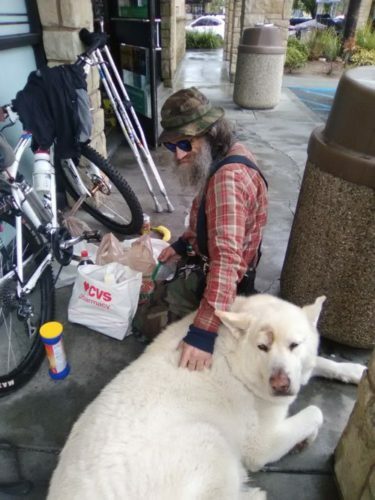 A Ventura County homeless veteran who needs our help. The Martin V. & Martha K. Smith Foundation is a multi-year supporter of local veterans and their families in Ventura County. They funded several grants that impacted the veterans that need us most, including major support for the Ventura County Veterans Treatment Court, and now the Veterans Connection. The Smith Foundation provided a $40,000 matching grant that has enabled us to expand our services to help veterans with employment and education services, VA claims, counseling, access to healthcare, wellness programs, and housing. Thank you to the Martin V. and Martha K. Smith Foundation for enhancing the quality of life for our veterans and their families! The Martin V. & Martha K. Smith Foundation was established by Martin V. “Bud” Smith and his wife Martha with the mission “To enhance the quality of life for residents of Ventura County”. Bud, the leading land and business developer in Ventura County for more than 50 years, and his wife Martha hoped that the Foundation would involve future generations of their family in continuing their appreciation of Ventura County and their care and concern for strengthening the community. Four of Bud and Martha Smith’s descendants serve on the board of the Foundation. Joining the Ventura County Community Foundation as a support organization in 1994, the Martin V. & Martha K. Smith Foundation provides funding to nonprofits in Ventura County through an annual grant program, with an emphasis on organizations serving the Oxnard plain. On behalf of our local veterans and their families in need, we are grateful to have the Meadowlark Service League as an ally for many years! The MSL held their annual funds distribution luncheon in support of various charities throughout Ventura County. This includes a $5,000 donation to GCVF, all of which will directly support local veterans and their families. We are appreciative of your hard work, time, and effort that led to your generous donation. It will help meet the needs of veterans and their families in greater Ventura County so that we may leave no veteran behind! Members of the USS Parche SS-384 Base USSVI from Port Hueneme stopped by the Veterans Connection on April 5, 2018, to present their donation that will go to fellow veterans in need. Thank you USS Parche SS-384 Base USSVI for your very generous $10,000 donation that will help homeless and needy veterans in Ventura County. With your support, we can help improve the quality of life for veterans, their families and our community. Chris, an intern with Mission Continues, and a friend carry furniture purchased for a formerly homeless disabled veteran and furnished in his new apartment. The Amgen Foundation’s support of our local veterans continues to grow with a generous $2,000 donation to the Veterans Connection program. The Veterans Connection program serves as a one-stop shop that provides support for our local veterans in collaboration with government agencies, nonprofit, and volunteer veteran service providers in Ventura County. The Veterans Connection program continues to grow as more and more veterans discover our services, such as educating them on available resources and helping them gain access to VA, CalVet and local services that they need and deserve. In 2017, the Veterans Connection program impacted the lives of more than 2,500 veterans and family members. With Amgen’s support, more services are planned. Thank you to the Amgen Foundation for their continued support to our community’s veterans and their families for the fourth straight year! Veterans receiving assistance with VA claims and employment. Thank you to the Hurlbut – Johnson Fund for another consecutive year $7,500 grant. Their contributions provide direct support to our disabled veterans in need. Their support enables us to provide a VA-accredited Veteran Service Officer field office space to assist with filing VA disability claims, wellness clinics, counseling for veterans coping with PTSD and powered mobility devices for our senior veterans. The Hurlbut – Johnson Fund was created to help strengthen the common good, improve quality of life and address the most challenging problems facing the community for well over 11 years. Assisting veterans at the Veterans Connection. The Amgen Foundation is a consecutive-year supporter of our local veterans with a generous $10,000 donation to the Veterans Connection program. The Veterans Connection program serves as a one-stop shop that provides support for our local veterans in collaboration with government agencies, nonprofit, and volunteer veteran service providers in and around Ventura County. These two happy Navy veterans were among the 150 veterans and family members who received wheelchairs, courtesy of the Knights of Columbus. The Knights of Columbus (KoC) Council 9410 from Simi Valley are longtime supporters of GCVF, our veterans and their families. KoC has raised and donated more than $41,000 since 2014. KoC holds annual Charity Poker Tournaments and Charity Golf Tournaments in support of charities throughout Ventura County. This included its 6th Annual Charity Golf Tournament at Moorpark Country Club this past October, where $6,000 was raised and donated to continue to assist our veteran population with the services, programs and opportunities they need. You will find their events entertaining and fun. Their annual Charity Texas Hold’em Poker Tournament and Monte Carlo Night is on May 5th. We hope to see you there! 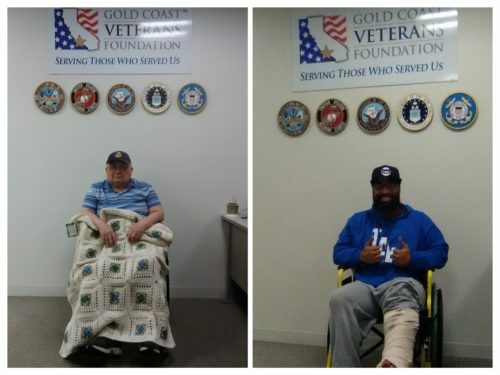 GCVF staff assisting a veteran with his resume and job search. Southern California Edison (SCE) is also a multiyear supporter of our veterans and their families. They provided generous gifts in 2014 and 2016, including most of the computers used at the Veterans Connection in Camarillo. Those gifts allow us to efficiently and effectively connect our veterans in need to the resources that make their lives easier. SCE recently approved a $5,000 grant that will go toward assisting veterans and active-duty military with career and job preparation. This includes career coaching, resume and networking, and assisting veterans in channeling experienced and gained military duties into new job and career skills. Thank you SCE for continuing to help build a better tomorrow for our veterans and their families! GCVF staff assisted a veteran with re-structuring his resume. Northrop Grumman funded our Veterans Career Coaching and Job Search services with a $2,400 grant in late 2017. Their donation helps many veterans and transitioning active-duty military get key resume assistance, advice and coaching for their career goals and advancement. We helped more than 100 veterans last year make smart career choices by informing them of the opportunities available within the community. By making those smart choices, they are motivated to become productive members of our community. On behalf of our veterans and their families, we wish to thank Northrop Grumman for helping us get the veterans the jobs that they want! 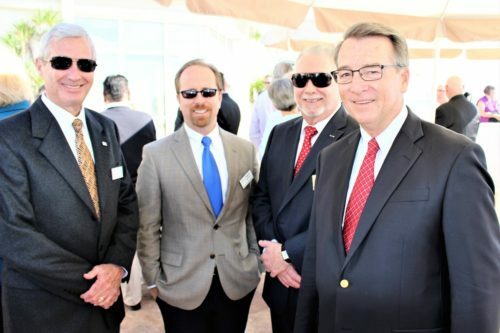 Ron Greenwood, Chairman GCVF (second from the right) attending Montecito Bank and Trust's Community Dividends award luncheon. Photo courtesy of Ben Malkin. A special thanks to Montecito Bank & Trust’s Community Dividend program for their continued support to GCVF! Their generous contributions led GCVF to create a program to train, certify, and support low and moderate income veterans in pursuit of affordable housing. For the second consecutive year, GCVF was presented with the Community Dividends award for $2,500 at an awards ceremony in Santa Barbara. November 14, 2017 - Thank You to Our Sponsors of the 12th Annual Charity Golf Tournament in Support of Veterans! And that is a wrap for this year’s 12th Annual Charity Golf Tournament in Support of Veterans! We had another very fun and successful tournament this year with veterans, golfers, sponsors, staff, and volunteers alike coming together at Spanish Hills Country Club for the sole purpose of supporting and honoring our local veterans and their families. It was a lot of tireless work to organize the tournament, but we are so grateful to our veterans and their families who have sacrificed so much to protect our freedoms that it is all worth it to give back to them, to provide the services, resources, and benefits that they have earned. Spanish Hills Country Club and its staff for hosting us again this year and working hard to prepare the course for optimal playing conditions for our golfers, as well as preparing the check-in area and dining area so well that we could all celebrate and honor together. New sponsors this year, such as Finance of America, RDO Equipment, and Pape Machinery, for coming on board to promote the importance of giving back to our veterans and their families who gave so much to us. All of our golfers, both individual golfers and those of sponsor members, for coming out to play to support our veterans and their families. All of our staff and volunteers who gave their time and efforts to make this year’s tournament a success! Thank you for your continuing contributions in supporting our veteran population! And on behalf of our veterans and their families, we express our deepest appreciation for your generous giving. Mobility devices available to improve the quality of life for our disabled veterans. 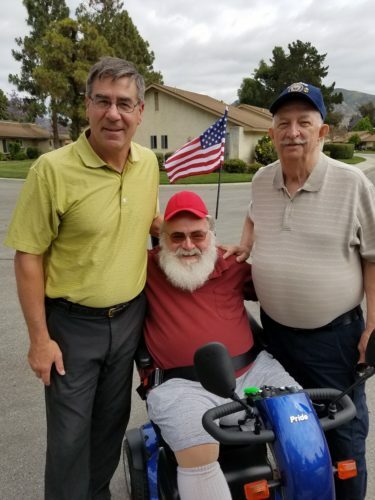 The Oxnard Monday Club made a generous $1,000 donation to fund replacement parts, batteries, support and repairs for disabled veterans’ electric mobility devices. This aid helps refurbish and maintain the motorized chairs for our veterans and their families when we distribute them. 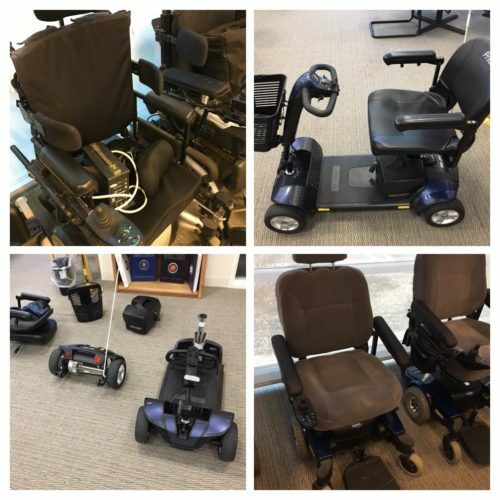 There are many disabled mobility devices at our Veterans Connection office, thanks to generous donations from our community! Thank you Oxnard Monday Club for your support to provide the best possible mobility devices for our veterans and their families.